Can you tell I’ve got the whole tropical/beach theme bouncing around in the ol’ noggin? The following originally appeared in the August 2, 2009 edition of the Tooele Transcript Bulletin. Every summer has its peak—like the crest of an ocean wave before it breaks. Be it a grand vacation moment or a subtle vibe in August’s dog days, summer’s peak arrives on its own schedule. The aim isn’t to predict or engineer it—it’s to catch the wave and ride it to shore. That moment came for me last Wednesday evening as I stood atop an 11 foot paddleboard on the surface of the Great Salt Lake. The water was cloudy blue and a balmy 75 degrees. A gentle southerly breeze carried with it the crisp scent of salt water. I was paddling toward a boat channel just east of the state marina, savoring what was shaping up to be a perfect summer evening. That’s a tall order for a guy who lives 683 miles from the nearest beach, and whose rhythm of life is dictated almost solely by my various bosses’ moods. It’s safe to say I’ll never reach true Hawaiian waterman status, but an innate obsession with all things water finds me, as often as possible, striving toward a Utah equivalent. 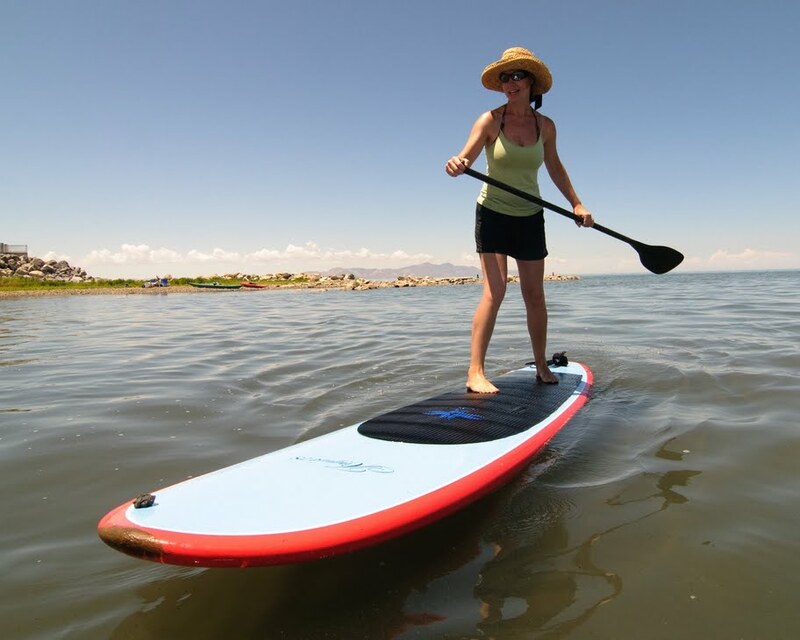 So when I heard about stand up paddle surfing on the Great Salt Lake, I was ecstatic. Stand up paddle surfing, or SUP, is a variant of surfing where the surfer stands on a surfboard and uses a paddle to propel and steer through the water. Since waves are not needed to propel the surfer, it can be done on any body of water. Rooted in the South Pacific, the practice is thought to have originated with ancient Polynesian surf instructors, who found they could both manage their students and monitor swell conditions by standing atop their boards. The concept was popularized on Waikiki in the 1960’s by Hawaiian watermen who used outrigger paddles with their longboards to photograph tourists learning how to surf. SUP was virtually unknown to the mainland until surfer Rick Thomas introduced it to California in 2000. The sport has since become viral in the lower 48 and has begun to see global popularity. Paddle boards are now hitting Utah waters, thanks in large part to Rebekka Stone, owner and operator of Utah Paddle Surfing. A native of Connecticut, she discovered SUP last year while living in Miami. Rebekka started Utah Paddle Surfing in January of this year. The company offers affordable clinics and board rentals at the marina. She invited me to one of her clinics last week. My sons Bridger, 8, and Weston, 6, natural beach bums themselves were happy to accompany me. The boys didn’t waste any time. When he reached the beach, Bridger leapt from the shore onto one of the August 78 boards floating on the beach. Weston dove straight into the water with his eyes open and learned first hand just how salty the Great Salt Lake is. Rebekka was prepared with a bottle of fresh water and was impressed how quickly he recovered. “I’ve seen grown men cry when they get that water in their eyes,” she said. Bridger and Weston hopped on two boards and paddled around the beach. After some brief instruction from Rebekka, I was up and paddling toward the horizon. As I reached the boat channel, I stopped paddling and stood still to take it all in. I was free, alive, in tune with the rolling waves—a wannabe waterman at his zenith. That’s when my perfect summer moment came. That’s also when I became one with the water—in the literal sense, when a large wave caught me broad-side. Only after my wipe out did I remember Rebekka’s instruction about paddling and waves. “Aim into the waves and paddle through them,” she had told me a few minutes earlier. Oops. Rebekka didn’t witness my “controlled fall,” but Weston did, and I heard him chuckle from afar as he dutifully alerted her. Thankfully it was my only fall of the evening. It didn’t take me long to get a feel for the board and the water’s groove. I spent the rest of the evening plying the lake’s briny depths, wondering where I could come up with $1300 to buy my own board. SUP boards are longer than normal surf boards, usually ranging from 9-14 feet. Most feature stern fins and padded decks. Since they are actually considered a vessel, SUP surfers are obliged to keep a life jacket on board. Rebekka recommends surfers actually wear the life jacket, even if means risking the cool surfer image. Storms and winds make can make the lake difficult to navigate. Rebekka encourages paddlers to stay close to shorelines and never venture into the middle of the lake without a marine radio and following several other safety precautions. After my last run, I began the onerous task of coaxing the boys out of the water. “You’re stalling,” I told them as they pretended to tow in their boards, never actually getting closer to shore. “Yes,” responded Bridger, “but it’s because it’ll be so long before we can come back here.” I realized that he had nearly forgotten we weren’t in some faraway place. We rinsed our feet off at the marina and began the short drive home. The boys requested some surf music, and of course I had some ready. Summer’s peak came a little late this year, but I’m glad we were there to catch the wave.